"You're gunna lose the support of the people who've always had your back." Electric Entertainment has debuted an official trailer for the indie drama LBJ, telling the story of Vice President Lyndon B. Johnson, who became President after John F. Kennedy was assassinated in 1963. 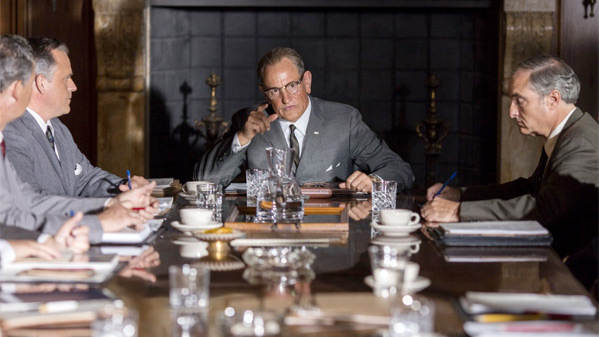 Oscar nominee Woody Harrelson stars as Lyndon B. Johnson, showing him before and during the election, as well as after the assassination when he had to take over the presidency during a time of national mourning. The film also stars Richard Jenkins as Sen. Richard Russell, Bill Pullman as Sen. Ralph Yarborough, Jeffrey Donovan as President John F. Kennedy, Kim Allen as Jacqueline Kennedy & Jennifer Jason Leigh as Lady Bird Johnson. This looks solid, with some very powerful scenes being featured in this trailer. Though it does seem a bit campy. After powerful Senate Majority Leader Lyndon Johnson (Woody Harrelson) loses the 1960 Democratic presidential nomination to Senator John F. Kennedy (Jeffrey Donovan), he agrees to be his young rival's running mate. But once they win the election, despite his extensive legislative experience and shrewd political instincts, Johnson finds himself sidelined in the role of vice president. That all changes on Nov. 22, 1963, when Kennedy is assassinated and Johnson, with his devoted wife Lady Bird (Jennifer Jason Leigh) by his side, is suddenly thrust into the presidency. LBJ is directed by filmmaker Rob Reiner, who has directed classics and great films such as Stand by Me, The Princess Bride, When Harry Met Sally, The Story of Us, Alex & Emma, Rumor Has It, The Bucket List, Flipped, And So It Goes, and most recently Being Charlie. The screenplay is written by Joey Hartstone. This first premiered at the Toronto and Zurich Film Festivals last year. Electric Entertainment will release LBJ in select theaters starting November 3rd.